If you’ve ever visited our nation’s capital, you know the metro area isn’t known for sprawling yards and large swaths of greenery. 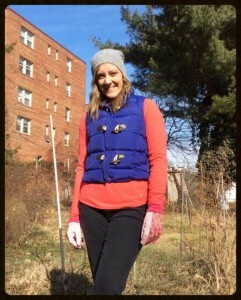 So when Mary Ackley set out to start a Washington, D.C.-based urban farm in late 2014, she had to get creative. Growing up in Michigan, Ackley’s family instilled a strong love of the outdoors and stewardship of the environment through activities like hiking, fishing, cross-country skiing and camping. Between completing degrees in Civil & Environmental Engineering and Natural Resources Management, she volunteered for the Peace Corps in Fiji. Eventually she embarked on a career as a foreign service officer, where she helped start a small urban garden in Sri Lanka. Eager to learn more about sustainable farming methods, she then applied—and was rejected—for an internship at Joel Salatin’s famed Polyface farm in Virginia’s Shenandoah Valley. Eager to learn more about sustainable farming methods, she then applied—and was rejected—for an internship at Joel Salatin’s famed Polyface farm in Virginia’s Shenandoah Valley. Undeterred, Ackley, a self-described “doer,” returned to D.C. to start her own farming venture. Her idea was to farm on several small, underutilized plots of land around the city, so she sent out a call to her network asking if anyone had a spare yard or other space. No one did. One day while running, Ackley passed a monastery on a sizeable piece of land in Edgewood. And so Little Wild Things City Farm was born. Ackley began learning more about SPIN [small plot intensive] farming, which emphasizes revenue targeting and establishing how much money a farmer can make from each individual crop. “Certain things don’t make the cut in SPIN farming,” Ackley says, which focuses less on growing heirloom and rare varieties and more on mainstream herbs and vegetables that people—and restaurants—buy regularly. Ackley began selling microgreens, herbs and vegetables at local markets (in addition to prepared salads with edible flowers) and soon secured her first big client, Chaia—a farm to table taquería that specializes in vegetarian and vegan tacos made from seasonal ingredients from local farms. “That was nice because I had one solid client that really supported what I was doing, and I gained the confidence to approach other restaurants,” she remembers. Now, Ackley supplies several D.C. restaurants and has partnered with The Pub & the People in Bloomingdale to secure a second, indoor growing location. She nurtures between 60 and 80 trays of microgreens per week in the restaurant’s cellar. She still sells at area markets and events, and recently added a line of microgreen pestos to her product lineup in order to help reduce food waste. While her multi-location model is working so far, she sometimes worries about its longevity. So far, Ackley has financed her business out-of-pocket with an initial investment of just a few thousand dollars, which she recouped in the first three months of operation. As she expands, she may consider applying for grants or utilizing other fundraising methods in order to secure more permanent locations. And then there are ethical dilemmas that arise from Ackley’s civil service background.